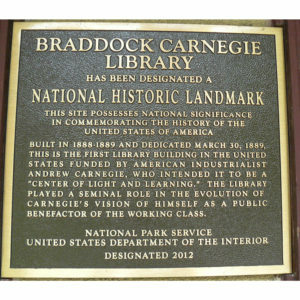 Andrew Carnegie’s first library was designated a National Historic Landmark in 2012 when the library was 123 years old. Today, it is a thriving and integral part of the neighborhoods it serves (Braddock, North Braddock, East Pittsburgh, Turtle Creek and Chalfant). 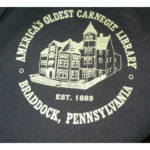 The Braddock Carnegie Library started with Carnegie’s idea that it would service not only the needs for art, culture and information but the needs of the whole person (or community) and this mammoth building was built with not only books and reading space but also a music hall/theater that could hold 900+ people, a gymnasium, a swimming pool and baths. 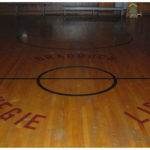 Some of the amenities have changed, others are under refurbishment and others are being used for the same original purposes. But it almost didn’t survive. 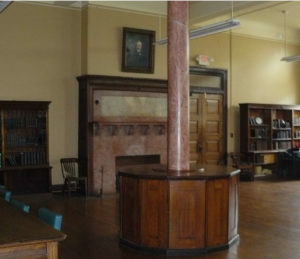 The library actually closed in 1974 when it was in disrepair and the General Braddock School District, who owned it at the time, could no longer afford the upkeep. The building then ended up on the Borough’s demolition list. Luckily a group of residents lead by the library’s last librarian, David Solomon, was able to buy the building and start the fundraising to get the building and the library back up and running. 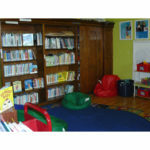 In 1983, one room opened as the children’s library and room by room, the library has come back to life. 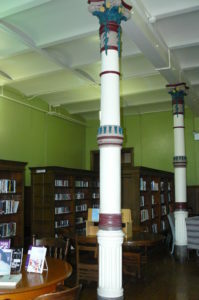 Some of the original books were rescued and much of the original architecture accents remain in place, although both have suffered considerable damages. While fundraising and rehab continues, the library’s four stories are open and offering tons of information and classes to the public. Now the library offers children’s and adult book sections, DVD’s, CD’s, alternate lending of art, community resources, puppets, a ceramics studio and print shop. All of this comes along with special and weekly scheduled programs for preschoolers, kids, teens and adults. Managed by Executive Director Vicki Vargo and a team she calls a “creative, progressive staff” of 8 full time and 10 part time employees, many volunteers and a great Board of Directors. Each season the specific programs change and include something for every age group like Computer, Language and Skills classes, Wheel Throwing, Storytime, Clay Time, YAAAZ (Young Adult Autonomous Art Zone), Career help, Current Event Discussion Group, Fitness (yoga and Zumba) and the Rainbow Kitchen Community Services. The team supports the Community Pizza Night at the Braddock Community Oven. And if that wasn’t enough, you can schedule meeting space and borrow chairs, tables, tents, cooking sets and yard tools! 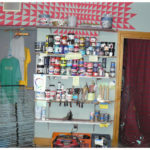 Some of the opportunities come from partnering with different community entities. 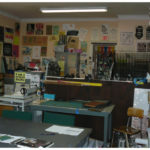 When Dipcraft (the fiberglass manufacturing plant located where Braddock and Rankin meet) was getting rid of print equipment, they offered it to Transformazium (a local art collaborative) who then approached the library and the Neighborhood Print Shop was born on the 3rd floor. In 2013, Transformazium participated in the Carnegie International with their Art Lending Collection with artists from the Interna tional donating pieces to the collection that most local libraries could only dream of having in-house. 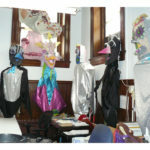 Cheryl Capezzuti has been a great partner to the library by sharing a portion of her Puppet collection which is a huge hit with young and old alike and offering puppet making workshops. The library partners with other organizations, including Heritage Community Initiatives, Greater Valley Community Services and TCV Community Services, to get programs up. Mandee, the Children’s librarian goes to different Day Cares, and the library offers Pop-up Library events in area parks and supports a satellite library at the Westinghouse Human Services Center Corporation building in Turtle Creek in space offered to the library at no cost by the HSCC. The ceramics studio was created from Sanders Consent Decree funds and the vision of a former board member. As part of the Allegheny County Library Association, the partnership also benefits the community users because you can use your county-wide library card to borrow any of the library’s materials and have access to the entire catalog and online eResources. ACLA consortium opens the catalog up to everyone which is remarkable and the eiNetwork has brought efficiencies that helped immensely and continually offers new ways for the library to operate. While partner donations have helped, running the library isn’t cheap and it’s always tough to balance the budget. 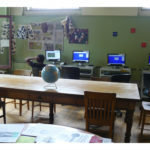 The library operates with funds from the Allegheny Regional Asset District (RAD), the Commonwealth of Pennsylvania, the Woodland Hills School District and local foundations and donations. The “Love Your Library” Month each September is a great way for anyone to support the library, and in 2018 funds are being generously matched by the Jack Buncher Foundation. And, as you can imagine, a building this big and old needs constant upkeep. Vicki Vargo knows that in the early 80’s it was a small group of community members who “put their hearts and souls” into the building to get it reopened. It will now take a bigger group to make sure that the building can be fully functional. By the end of 2018 the library hopes to have construction drawings to put costs to their building master plan for renovations of the entire building including the music hall, new heating and air, an elevator and accessibility for all. 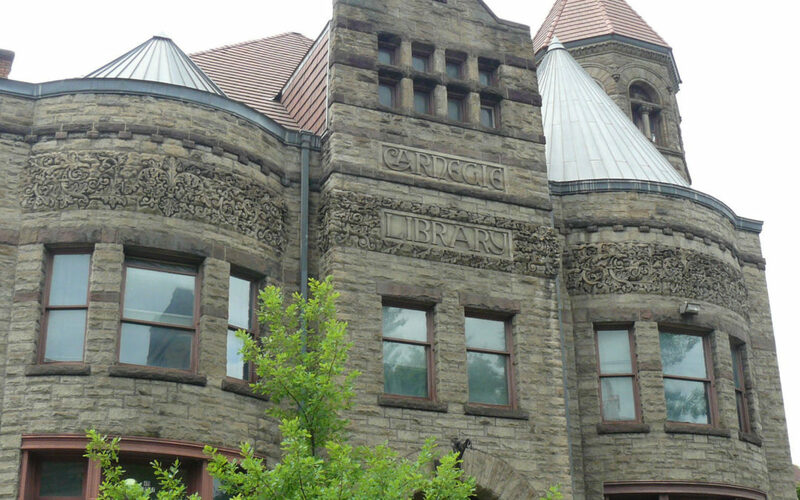 Stay tuned as more information unfolds for the Braddock Carnegie Library’s renovation plans and ways that you can help to assure that the library continues to be one of the jewels of Braddock and the EastShore! 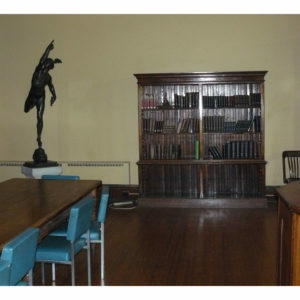 Check them out at www.braddockcarnegielibrary.org, 412-351-5356 or come in person to see the beautiful architecture, the history and all that is offered at 419 Library Street, Braddock.